Identity crisis? No, I'm a primary school teacher! : Should I role-play fighting with my class?...even if I let someone else be Luke Skywalker!? Should I role-play fighting with my class?...even if I let someone else be Luke Skywalker!? My raised arm morphed from a machine gun into a tickle stick, and much laughter ensued as the game developed to include more and more of the class. The dilemma I'm left with is whether it's ok for young children to role play fighting, particularly with weapons? Fighting comes in many forms and I've attempted to list the ones that I can think of in some sort of order of 'terribleness'...where would you draw a line of acceptability? Two kittens playing with a mouse. Soldiers shooting robot alien attackers. A fight scene from Karate Kid. A tustle between a criminal and a Police Officer. A Roman hand to hand battle. A drunken brawl as seen on TV. A Police Officer shooting a terrorist. A terrorist shooting a Police Officer. Clearly any role-play that involves actual physical attack and harm has to be stopped, but surely role-playing something that's seen in the natural world or comes from a children's story book is acceptable? But then what about role playing violent scenes from children's films...is it ok if they're based on cartoons, or involve mythical of non-human characters? Our topic this half term is 'People who help us'. Is it ok for the children to role-play Police Officers or Soldiers in shooting games? 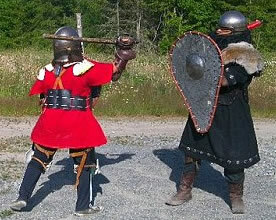 What about re-enacting a fight scene from Eastenders, or a Roman battle scene from a text book? If I condone superhero battles or shooting alien robots, is it ok to let the children spend a morning building 3D models of weapons before unleashing them on each other? I've spent a little time researching this dilemma on the internet, and it seems that academic opinion is very much split. Conclusions on such role-play range from 'it helps children to investigate and experience some of the issues involved in a safe way', through to 'it encourages real violence'. Apparently some schools actually have policies on 'Valuing and managing weapon play'. I don't quite feel ready to suggest such a policy to my headteacher (with 4 years as an Army Officer and only 1 term in Nursery on my CV, I fear this would be a career limiting move! ), but I don't want to sweep the issue under the carpet either. We have to try and build up an alternative society of respect for human rights (and children's rights), where 'might is right' doesn't work. Where I am, guns kill people and there is an escalation of violence and crime, together with abuse of power even by the police (I write from South Africa, with its long tradition of 'might is right'). "Power corrupts and absolute power corrupts absolutely" (Lord Acton). Solid post! Where does this stand now with you? The above comment is the very thing that makes this whole question/discussion so complicated because what anonymous said is true and then, I think of the proud moment I felt when the children poisoned me a couple weeks ago during their dramatic play. That particular group hadn't worked cohesively -- or rather, both feet in -- in imaginary play and that story line indicated that they had decided to commit wholeheartedly. Their play, and their teamwork, has really changed since then. They are a community of children, having banded and bonded together. Let me be clear, an essential part of this community is kindness and truly caring for each other. Have been considering for a few days...is certainly complicated. Anonymous has made me think about the power aspect of the role-play more carefully, and to reflect on my time in the Army. My current thoughts are to monitor the play to ensure there is no power abuse, and to steer the children towards 'protection/saving others' type scenarios where possible. It definitely is a tough one. The main thing I find hard is that we have an army, who use weapons, many of the children will know someone who has been or is in the army. I would find it hard to say to children you can't role play this when it is real life... After all, isn't that what they're doing? Trying to figure out life by playing different roles? Last year I allowed this role play, my rule was that you aren't allowed to pretend shoot other people, only imaginary enemies (I said this because we had issues with children not involved being "shot" which was upsetting them. Hmm... Lots to think about.